It’s Bear’s birthday, and he’s determined to prepare for his party all by himself. Who can get dressed, pick apples, and make peanut butter and honey sandwiches without (much) help from Mama and Papa? This bear can! Then Bear finds out there are some things that can’t be done. But with friends and family by his side, a bear can still save the day! Reaching an age of some independence and self-sufficiency is the highlight of this little bear’s birthday milestone. Now that Bear is old enough he can prepare for his party, with some minimal help from Mama and Papa, by getting dressed, picking apples, and making peanut-butter-and-honey sandwiches. But when a sudden gust of wind blows the autumn leaves everywhere right in the midst of his celebration, Bear tries to apply his can-do attitude to putting the leaves back on the trees before realizing the impossibility. Instead, Bear and friends rake all the leaves into a giant pile that’s perfect for play and jumping. Watercolor-and-graphite illustrations depict Bear, all eager adorableness, so very pleased with his newly acquired abilities. “This bear did it…all by himself!” exclaims a smiling Bear. Capucilli’s growing-up theme, familiar with preschoolers, shines through in this latest outing. Kids will easily identify with familiar scenes such as height measurement, the special way to lay out a coat on the floor for easy dressing, and the birthday cake finale. Bear’s confident, lovable approach to life will serve little ones well. 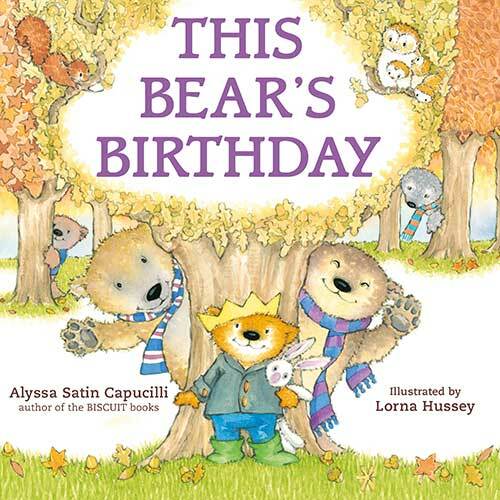 This appealing companion book to Capucilli and Hussey’s “Not This Bear” (2015) will hit the mark for young children, who take pride in their own hard-won steps toward independence.